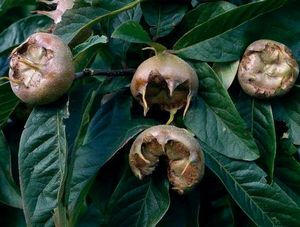 Medlar - Nottingham 2 year old £17.50 - Medlar Apple Trees and Fruit Trees For Sale. Buy at competitive prices with wholesale discounts. Nottingham is widely considered the best flavoured Medlar. It has a weeping habit and twisting branches, making a pretty ornamental tree with white flowers in the spring and autumn leaves turning a golden orange. <br> <br> Fruits are ready to be picked from mid October and early November to then be stored for a few weeks whilst they ‘blet’ – after which they are soft enough to eat. Nottingham is widely considered the best flavoured Medlar. It has a weeping habit and twisting branches, making a pretty ornamental tree with white flowers in the spring and autumn leaves turning a golden orange. Fruits are ready to be picked from mid October and early November to then be stored for a few weeks whilst they ‘blet’ – after which they are soft enough to eat.